Like clockwork, yesterday the same law blog published more of our legal content from TheLaw.com. When it comes to managing the effects of Google’s Panda and Penguin algorithms on RSS feeds (a part of SEO fundamentals), issues like this cannot be ignored. If you’re a law firm marketing to clients on the Internet, it’s unwise to ever leave any of your web properties in shambles since it makes for a very poor impression. And even worse, you may even be negatively impacting your law firm’s rank in search engines and I’ll explain why. In my last blog post I told you that thanks to backlink checking services that I use for search engine optimization, I discovered that a spammy blog created by a law firm’s website development and marketing company was back to its old practices. 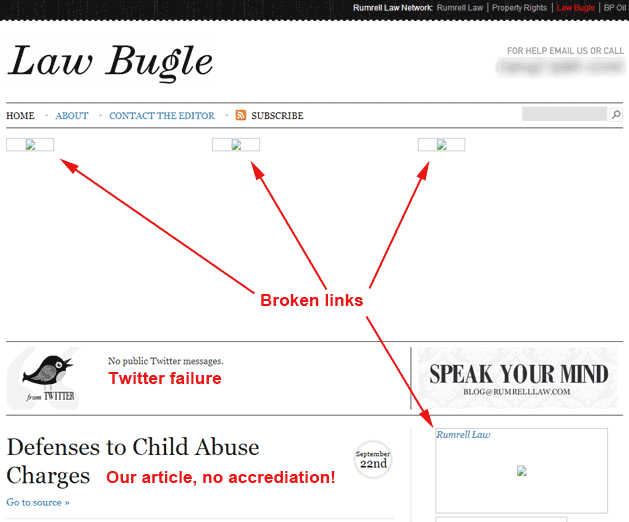 Above is the home page for The Law Bugle and a recent article of ours sits right at the top of the recent articles list. Perhaps we should be grateful that at least the attorney marketing company didn’t see fit to provide accreditation to our website on this mess. The name of the law firm that owns the site and a link to its website appears right at the top of the page. There is another link to its official blog. And virtually every one of those broken image links also includes a hyperlink back to the law firm. This is horrendous from a front facing public relations perspective. Potential and current clients may wonder whether the law firm is as sloppy on the inside as it is on the outside. But as you’ll see, it’s even more damaging when observing for search engine optimization purposes. A backlink to our site appears in each article – but that actually works against us. A site like this is considered a source of search engine spam, which consists of dropping as many pages into the search engine and hoping to catch a few clicks should results ever appear within the first few returned pages. All of the backlinks on this site are “do follow” hyperlinks, which means that they pass page rank. If a site wants to provide a link but not authority to a website, they need to use the “nofollow” tag in anchor link. Google may count a backlink from a spammy site as a “negative referral” for page rank. And while there is only one hyperlink back to our site, the links in the broken images will still pass negative page rank back to the law firm’s site as will the other links on the page. That will create an even larger problem of suspicious link building or “link schemes” and Google may take a manual action against the website and throttle the traffic that it receives. The interior pages are no better and has remained in this atrocious condition for no less than the past year. I decided to take a brief look at the law firm’s “Property Rights Forum” which is their legal blog. Much to my surprise, its condition still has not changed. It’s terribly dated, sports a horrendous wood paneled background image, features even more broken links, missing images and has severe formatting problems. Out of respect for my learned colleagues, I’ve decided not to post a picture of their law forum blog. When I contact them again next week with yet another takedown request, I’ll probably propose that we handle their law firm marketing efforts since clearly their current relationship isn’t working too well. Let’s hope that by then, I’ll have more time to spend productively bringing the great new features online that I hoped to provide, including news of the next Law Dictionary app.